Assoc. Prof. Petra Roter took part at the 10th Anniversary of the Bolzano/Bozen Recommendations on National Minorities in Inter-State Relations: New Challenges and Lessons Learned (available here). 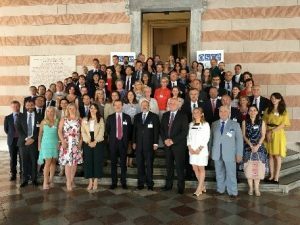 The conference that marked a decade of the important set of recommendations by the OSCE High Commissioner on National Minorities took place in Udine, Italy, on 15 and 16 July 2018. Dr. Roter participated at the panel on ‘The role of multilateral institutions in preventing and responding to inter-state disputes on national minorities’, together with Ms. Simona Granata-Menghini, Deputy-Secretary, European Commission for Democracy through Law (Venice Commission), Prof. Alexei Avtonomov, Professor, Russian State University for the Humanities, member of the UN Committee on the Elimination of Racial Discrimination, and Mr. Gigi Tsereteli, President of the OSCE Parliamentary Assembly. Find more information about it here.